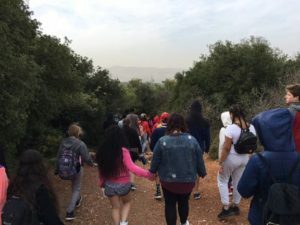 They started the day with a hike in the Galilee on Mt Meron and learned about winemaking, oak trees, and the blazes that mark a trail and help hikers find their way. 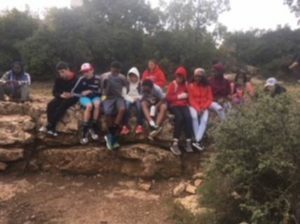 At least two Israeli school groups were also up on Mt Meron. For them, climbing a mountain within view of another country is a normal. For our students, not so much. Nevertheless, they enjoyed it a lot. 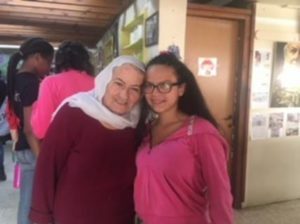 Others, like Amanda below, liked meeting the wise and inspiring Druze woman – Safta Jamila. Now, elderly, vibrant and forceful in Hebrew, she has built a multimillion dollar business. 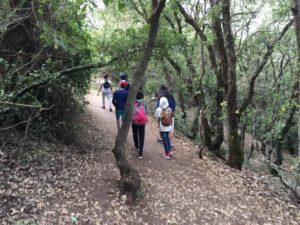 But at age 7 or 8, her parents took her out of school so she could follow her mother through the fields, in what is now Northern Israel, to study native herbs and their medicinal value by her mother’s side. Over the years, she turned that knowledge into a totally natural and organic cosmetic business. Safta Jamila taught them that you can make anything happen. You just need to have a goal. 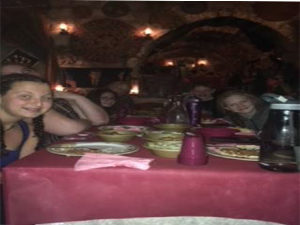 From there, the students met Kamal who served them a Druze feast and shared the customs of the Druze in a two thousand-year-old house. 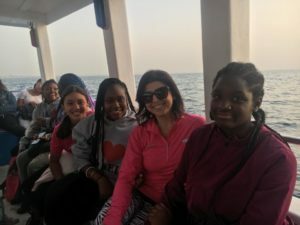 Just before sunset they soaked up Israeli culture of a different kind – they boarded a boat that blasted Israeli pop music, a danceable and Middle Eastern beat with Hebrew lyrics! 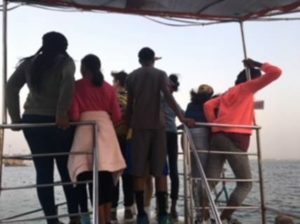 Most of the students sat at the side of the boat, while the chaperones danced. There are 2 days left, and the students are having fun but they are also looking forward to returning home. Over the course of the trip there has been many changes in the students. They are no longer glued to their phones and they have new friends and a deeper understanding of a foreign land. Tomorrow they will tour the kibbutz where they are staying and spend some more time learning about Israeli and regional politics. Stay tuned!